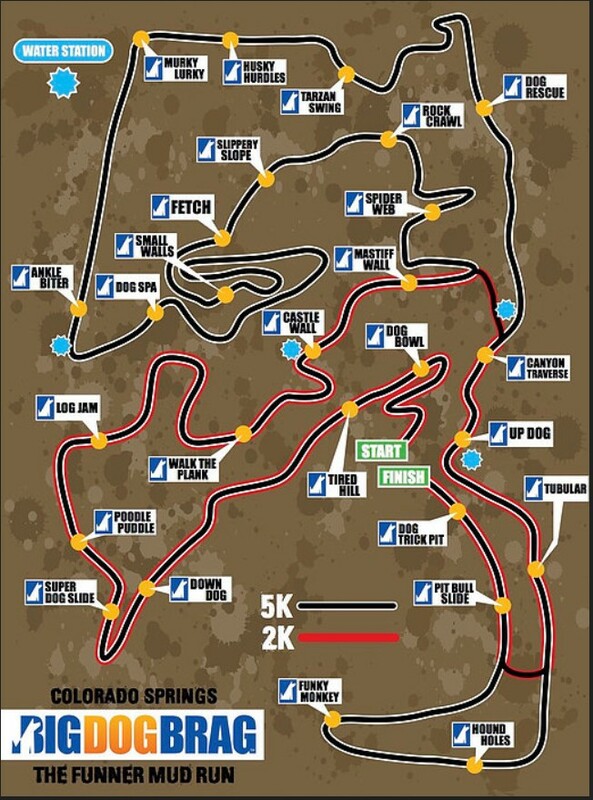 Big dog brag...The Colorado Mud Run transforms the natural obstacles of Colorado's rugged terrain into 25+ muddy obstacles on our family-friendly 5k and 2k courses. Splash down the 70-foot Mud Slide, climb over cargo net canyons, slog your way through real mud pits...not just dirty water, rope climb on Colorado boulders, balance on swinging bridges, experience the gorilla swing and sprint across the floating platforms. You can race with your best buddies to the finish line or soak up each challenge at your own pace. Get dirty with Colorado's most affordable five star rated mud obstacle run! If you can’t or don’t want to do any particular obstacle, that is perfectly fine. Go at your own pace…no worries! Have fun! You’ll still receive your finisher medal and BIG DOG BRAGGIN’ RIGHTS! Faster runners may complete the 5k in about 30 minutes, but most runners will take 60-90 minutes. The 2k course is totally about fun and taking your time to enjoy the obstacles and the mud…it’s a mile of fun, obstacles and mud! Nobody on our staff cares how long it takes you to get done as long as your having fun…we’re having fun! The Terrain is too dangerous for bare feet! Closed toe shoes are best! There will be a Dog Wash station to rinse off the worst of it…so you can get into a change of clothes. That does not mean full blown showers with hot water, soap, hair dryers and towels! Remember, this is a mud run in the middle of nowhere so be sure to bring a towel and another set of clothes or something to cover the seats in your car! Shoes can be donated to a non-profit that cleans them up and sends them to third world countries. We know it’s called the BIGDOGBRAG but this is a human challenge course! Serivce dogs are allowed. Controlled chaos! Thousands of fellow mud obstacle enthusiasts will be joining you on the PLAYGROUND. Just follow our Barking Guides to your parking space, then follow the signs to check in and registration, get your bags checked and then be ready to be pumped up by our trainers as we prepare you to face the BIG DOG Mud challenge. You’ll run, get muddy, sweat, have a ton of fun, laugh really hard, groan and moan, cheer others on, help others along the way, and finish strong! Then, you’ll shower off, change clothes, hang out, relax and tell stories, brag, laugh some more, tell more stories and chow down on our vendors’ food and beverages. We bark, howl, and do a dance of celebration! More MUD..More FUN! Seriously, if the weather or terrain is too dangerous because of weather, we will cancel the event and move it to the next possible date. Remember, this is a mud run - bring clean clothes and shoes! We ask for a $5 to the National Alliance on Mental Illness in exchange for parking on race day. Carpool if you can! Spectators are always welcome and there is no charge! We can’t pull off something this BIG without you! Join the Dog Pound Crew in Pueblo or Colorado Springs and help us make the BIGDOGBRAG the most memorable event experiences in Colorado. We have a limited number of volunteer openings so please sign up early and be a part of something BIG! We have a variety of shift times starting 7 AM ending at 4 PM. When you sign up you can select the right time for you. When you sign up you’ll be able to select general categories you’d like to help out in and we’ll do our best to get you there but no guarantees. You will receive an e-mail when you register and our volunteer coordinator will be in contact with you a couple weeks before the race to give you more specific instructions. Head over to the BIGDOGBRAG website to volunteer! Packet Pickup - If you register before June 5, you can pick up the packet from our sponsor Rocky Mountain Eye Center at 27 Montebello Rd, Pueblo, CO, 81001. If you can't make it there or register after June 5th, you can pick up your packet on Race Day at the check-in desk! If you have purchased an adult 5K pass and your kids are signed up for the 2K - you can run with them for free! No need to buy a 2K pass for yourself. Age Limit - The 5K is intended for participants 12 or older, but it’s ultimately up to each parent whether or not their child under the age of 12 can participate. The 2K is intended for participants 5 and up. Anyone 5-11 must have a parent or guardian running with them. Each participant must sign a waiver (when you register). Any participants under 18 on the day of the race must have a parent or guardian sign the wavier. Changing wave times - You can change your wave time, however please do it as early as possible as wave times fill up as we close in to race day. Go to your confirmation page and look under "tickets" to change your wave time (or t-shirt size). Discounts - if you are running with a team of 10 or more, you are eligible for a corporate discount. Send an email to [email protected] for more details. Where can I store my valuables? - In the trunk of your car, or we can hold on to them for $3 per bag. Will there be showers available? - There will be a Dog Wash station to rinse off the worst of it…so you can get into a change of clothes. That does not mean full blown showers with hot water, soap, hair dryers and towels! Remember, this is a mud run in the middle of nowhere so be sure to bring a towel and another set of clothes or something to cover the seats in your car! Shoes can be donated to a non-profit that cleans them up and sends them to third world countries. How was BIGDOGBRAG The Colorado Mud Run - Pueblo?